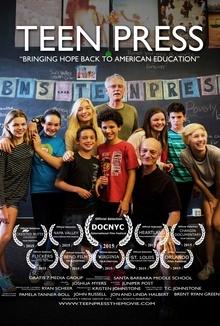 Teen Press is short documentary film about the Santa Barbara Middle School Teen Press program and how it's changing education from the inside out. Today’s media is filled with stories of America’s struggling education system. There is a consistent narrative about what is being done wrong—this is a story of how one school is doing it right..
“Teen Press” is a short documentary about one semester of the Santa Barbara Middle School Teen Press program. The film follows the selection process and initial training, as well as multiple interviews—with celebrities and unknown heroes alike—throughout the United States. Educator’s screening license, downloadable film, 5-day curriculum, downloadable 50-page cookbook. This kit gives you everything to get started! Teen Press license for classroom screenings. Teen Press Screener for personal use. Rent Teen Press to pre-screen film. This license is for personal use only.